Apparently this cycle of chemo treatment is going to have the theme of bump in the road followed by a successful treatment where I’m still dealing with it fine. The bump in the road is characterized by the picture for this piece. And anyone who knows my family has NO trouble identifying the she in the graphic. My mother is one of the most wonderful people on this planet, and she has so many special talents, she shares her gifts with all, has the most amazing heart, but one thing she was born completely without—a sense of time. I love her to death and beyond, but have accepted for many years, the area where she will not come through consistently is being somewhere on time. She sets off with the best intentions in the world, but … sometimes it stays at intention. The plan for this week was that mom would provide the chemo treatment limo service because hubs didn’t know whether he’d be working or not. The plan for this morning was that we leave my place at 9:00 because my appointment was for 10:00 at the doctor’s other facility, which is farther from my house, and it would be the first time travelling there. Plus, right now there is surface street construction ongoing everywhere, as well as freeway construction, so leaving a little padding (and I mean little) on the time was wise. At 9:20 I left a message for my mom on her cell because I knew if we didn’t leave then, we’d be late for my appointment. Mom called having reached our place at about 9:30. She had been having a few issues which delayed her departure (not uncommon), but had we waited and had she driven, I’d have been about half an hour late. I drove us to the appointment (I drive faster), on the freeway, in the car pool lane (which she usually won’t drive) and we managed to make it and find the building, arriving smack on time. YAY for small successes. Next minor and not unanticipated bump in the chemo road? Not able to get the vein. I always explain upfront to all people who draw my blood, try to insert a drip, etc. that what they are looking at is not necessarily what is going to work. I have small, squirrelly veins. Which means they are small, so a challenge right off, the squirrelly means that now you see it, now you don’t, and to make matters worse, they collapse easily. I also tell the technician/nurse to take their time up front, because that usually means a better chance of success. And I have met with arrogance to my statements, like somehow a lifetime of having people miss the vein will somehow not be the case when they do the sticking. As long as the person listens and gives it their best try, I don’t have a problem with an occasional miss. It happens to everyone—even my regular doctor who has a perfect record, except for once, and he has drawn my blood countless times over the years. The picture you see is what happened today. Yes, this is after it has been iced. I don’t blame my chemo nurse. She listened, she communicated that she understood exactly what I meant as she took her time trying to find a good candidate—especially when one she thought was going to do just fine suddenly disappeared on her, and it was prior to the stick (thank goodness). 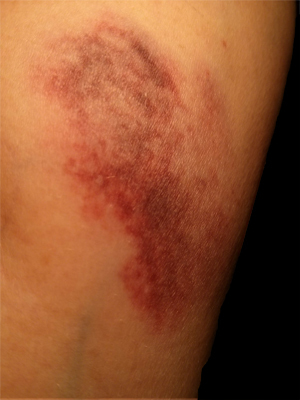 And technically the bruise is not from a “miss”. She got the vein. The problem was that the vein was not cooperating with allowing the drip to move on through. It bubbled. It bulged. The drip was quickly turned off and the doctor happened to walk past in the hall, so I made a joke about her having it notated in my chart challenging. 🙂 She came in and took a look and said she’d do it and put it in the back of my right hand after a brief discussion (from the peanut gallery = me) about keeping the drip lines out of the way so I could work on my laptop, and the fact that my compression glove wouldn’t work as well with the drip in the way. After reminding me of the priorities (I said laptop, of course #joking), we got everything switched over with only one minor hiccough where the vein, which had stopped feeding back blood, decided to start pumping it out. I may have turned a slight shade of green at that point. I don’t do well with blood. If someone is hurt and I have to react to take care of the situation, I’m fine until the situation is over, then get queasy. But in this case, I couldn’t do anything to stop it, so queasy hit me pretty quickly. But once they got it out and the pillow case changed, I was fine. I’ll be wearing the battle scar for a few days. But as I said, this was not an unanticipated bump. The remainder of the visit was uneventful. Hubs was able to come back and sit with me for the entire time, because it was a slow day and there weren’t any other patients scheduled for chemo while I was there. We were able to leave, half an hour earlier than anticipated, I had a little lunch, and took a nice nap in the afternoon. The nap was necessary because I had an interrupted sleep due to my first bout of chemo diarrhea, which was not all that bad, but did have me up a few times. One thing I wanted to say, and I mean this from the heart. I am very early in my journey still, and I know that things will not always be going as smoothly as they have so far, but I couldn’t ask for a better set of cheerleaders along my way. You guys rock!!!! Your support through this time means more than I can say, because no matter how alone I am, I know you are at the other end of the keyboard and are there for me every step along the way. You’re doing great Liana! I know that it might get a bit rockier as time goes on. And if it does, then you can deal with it THEN. You are handling this with incredible grace and calm. I like the methodical way that you approach the challenge: identify potential potholes up front (mom’s timetable, squirrelly veins) and choose not to waste any “worry energy” on them in the event that they do trip you up. The psychology of this is genius. It leaves a lot more of you at the ready in case something truly unexpected happens. You were right when you said that you are NOT going through this alone. You have people praying for you and lifting you up daily. And I’m sure that many of us would also be happy to be helpful in more physical ways – perhaps as a backup chemo driver? Or anything else you can think of. Just holler! We don’t know your needs as well as you do. Hugs! My mother always says, “Don’t borrow trouble, or trouble borrows you.” and I’ve heard that my whole life and have internalized it. I can’t do anything about what’s coming up, I can only make plans and have reasonable back ups. Take each moment as it comes, and deal with IT and not everything else in the world. I’ll definitely keep everyone posted on ways in which I might need help. Chemo drivers may be topping the list in the near future. For this round, I should be covered. 🙂 One more day. And mom said morning, (2 PM appt.) so I’ll have more time to punt. Hubs is working tomorrow. But I think with the time, we should be fine. So glad your hubs was home and able to help with the chemo transport. Bless your mom – some of the best people I know seem to run on their own special version of time. We have to tell my aunt that events start an hour before they actually do – all so she won’t be more than an hour late. I, too, have squirrelly veins (love that term – think I’m going to adopt it). The veins that look awesome? Will disappear and roll every single time. So frustrating especially when you end up sporting a beautiful bruise like that!